But will it grow in lava? I did bring home seeds that will probably go into big containers, rather than into my lava yard! Please do read her post on this wonderful event. She covers it professionally and with good close-ups of some of the seeds and plants available. I do want to comment on it, however, and show a few of the pictures I took while there. 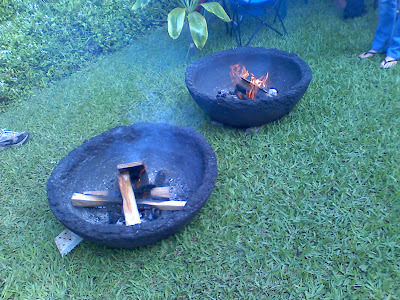 The Theme of “Ignite the Fire Within” was illustrated by two fire bowls. 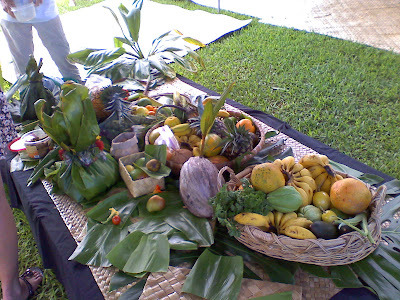 The gathered fruit offerings brought by the community of gardeners. So many of us lost plants to the sulfur dioxide. A friend brought blooms from her two protea that survived, saying that it was Pele’s way of weeding out and that the survivors were to be blessed. Care for a refreshing drink of coconut water? Next year I plan to wear boots and carry a bigger bag for seeds and plants. 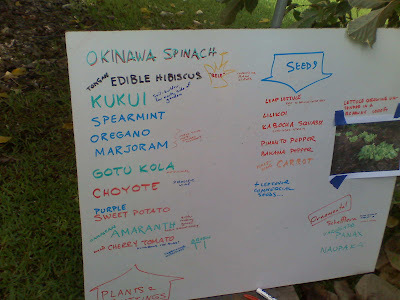 Posted on June 23, 2008 Categories FRUIT, GARDENING, Hawai`ian Gardening, Seed ExchangeTags FRUIT, GARDENING, hawaiian gardening, Seed ExchangeLeave a comment on But will it grow in lava? One of the plants that seems to grow well here is protea. Some of the local folks call it pro-TAY-ah, but the official pronunciation is PRO-tee-ah. However you want to say it, protea is one of the magnificent tropical blooms that mainland people spend a lot of money to have. You’ll see huge tropical arrangements in the big hotels with the many colors and shapes of protea. Often tourists think they are plastic because they look fake. http://en.wikipedia.org/wiki/Proteus explains the name, which comes from the Greek god, Proteus, who could change shape. The protea blossoms take on many shapes and varieties, as you can see from the links in this post. Protea is native to South Africa and Australia, but grows extremely well here in Hawai`i. It doesn’t do well in wet areas, and we are in a dry part. A little peat moss mixed with perlite makes a good planting medium. You make a hole, put the rooted cutting in, and let it grow! I had big dreams of converting the back half-acre of my property into a protea farm. The a`a lava around here provides the perfect conditions for successfully growing protea. 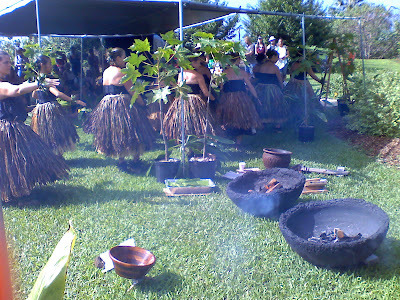 The problem is that some of the a`a hides what we call “blue rock,” which roots cannot penetrate. I’ve planted many different kinds of protea, but so far none have done well at all. 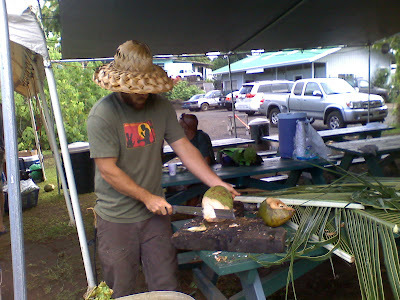 This article http://www.ctahr.hawaii.edu/oc/freepubs/pdf/NPH-11.pdf is about the Leucospermum, more commonly called “pincushion.” Dr. Leonhardt, one of the authors of the article, came to talk with a group of us who either are protea farmers, or who hoped to become protea farmers (that included me). He was interested in getting us to help him in a research project. The group was too loosely organized to get that project going. I managed to get one pincushion bloom before the volcano got them. It’s a sad looking specimen – nothing like the beauties in the links above, but it was my bloom (see above photo). Next week, I’ll tell you about some of my other “disasters” in trying to start plants here. There is dramatic starkness in an acre of lava. The huge ancient swooping ohia trees provide more shades of black and gray against the stony landscape. Another early growth out of new lava is the bit of green fern that gives a spot of color amidst the somber monotone. The legend told to every newcomer to Hawaii is that Madam Pele will turn you upside down and give you a good shaking. If you can survive that, she allows you to stay, but on her terms. Learning how to handle her and accommodate her moodiness is part of gardening here. Walking across the a`a lava can be tricky, and I developed a better sense of balance in the process, along with nicks and bruises. Picking up the lava rocks can do some real damage to your skin. I tried using gloves at first, but found it was faster to simply pick them up to move them. My skin toughened up at last. But skin wasn’t the only thing that suffered. The tires on my car were getting shredded from driving over the rough stones. I needed to cover up the driveway to protect my tires. I bought the cinder, and a friend called in a favor from a dump truck owner. Once the cinder was on the driveway, he used his little Bobcat and smoothed it out. What a difference it made! I also wanted a place to park near the house, so a base was put down and cinder dumped on that, as well. Here are pictures of that process. Never would I have thought I could be that excited over a load of cinder!
. . . and not a drop to drink! 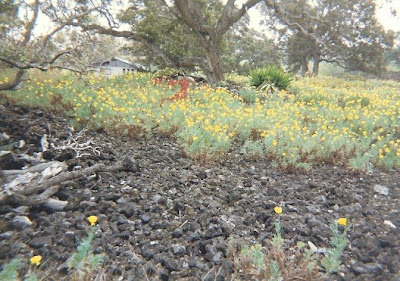 The first item to be addressed on our acre of lava was a 15,000 gallon water catchment tank full of algae. The water in the tank was full to the brim, but the color of the green on the sides of this blog! In the toilets, it was almost black. I found a young man in the area who worked on water tanks http://www.poolbrite.net/. He took one look inside and vowed he’d never seen a tank so green, and definitely didn’t encourage me to use it! Over the next few weeks, he “shocked” the water several times, killed off all the algae, then vacuumed it out. He went through this process several times, before he felt it was useable. Notice, I didn’t say “drinkable!” Even after a couple of years, I still buy my drinking water, although I’m sure it is fine now. I plan to put in an ultra violet filter that will make it safe for drinking. The cover on the tank was old, covered in bird sh*t, and a dead bird was in the bottom of the tank. As soon as the water started to look clear, I bought a new cover (see photo above). This keeps the sun off the water and protects it from any outside debris. The gutters are designed to catch all our rain and pipe it to the tank. We added a gutter on the shed in order to maximize the water we caught. Every drop counts around here! There is a net bag at the end of each pipe to catch leaves and trash before the water enters the tank. There is a pump under the house that then pumps the tank water back to the house for use. We installed two filters – one to take out the chlorine and the other to catch anything else that might have gotten through. These are replaced about every six weeks, or you end up with the pump clogged and not working. 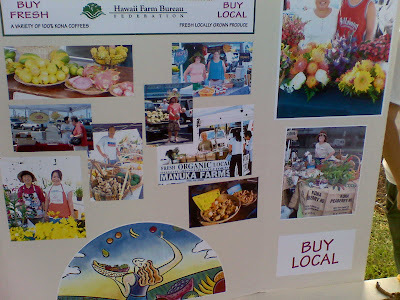 While suburbanites make an effort to be “green” by buying 50-gallon rain barrels, that wouldn’t go far here on the south end of the Big Island of Hawai`i. We live off catchment water. We love the rainy season, and a drought can hit us hard. By late summer, I may have to buy 4,000 gallons ($150) from a water truck that gets it from the county. They will pump it in, getting us through until the first rain, but it messes up the chemical balance in the tank. There is a delicate balance to maintain the water. The pH and chlorine levels need to be just right, so I’m constantly checking, then adding whatever is necessary to keep it right. I rigged a “Mark Twain” kind of rope so I can measure the depth. “Conservation” is the constant word of the day. But I lived on my 37′ sailboat (http://lothlorien-lucy.blogspot.com/) so I already knew about conserving water. There were so many things I wanted to do – plant a garden, make curtains, buy a stove – but our basic need for water came first. I’m pleased with what has been accomplished. Posted on June 4, 2008 Categories GARDENING, Green Living, HOMESTEADING, Sustainable Living, Water CatchmentTags Green Living, HOMESTEADING, Sustainable Living, Water CatchmentLeave a comment on . . . and not a drop to drink! I admit it! I get jealous when I read my usual gardening magazines and see people digging in rich loam, trying to decide the best landscape design to showcase their home. My years of gardening in California and Arizona are proving to be useless here in Hawai`i. One would think it is similar, and that may be true for some parts of Hawai`i. It’s certainly not the case for those of us living on the south end of the Big Island of Hawai`i, and in this particular area. There is a beautiful legend about ohia trees and the lehua blossom that blooms on them. The process involves moving aside enough rocks to get a nice hole (without the rocks rolling back down into the hole), then pouring in a bucket or bag of soil for your plant. Of course, every time it rains or you water, the soil filters down into the cracks between the lava rocks, so of course, you need to pour in more fresh soil. Still, I’m very happy to be here, so I won’t bore you with what led to the purchase of this acre. This blog will guide you through the ongoing process of converting lava into a more friendly growing place.